grandma's cookie jar: Help Your Grandchildren Learn God's Word Is Essential! Help Your Grandchildren Learn God's Word Is Essential! If your grandchildren are like the average person in America, they have Bibles in their homes. Consider the following statistics about American use of the Bible according to Gallup . . . Most Americans own a Bible. In fact, 92% of households in America own at least one copy. Of those households that own a Bible, the average number of Bibles is three. This includes not only the homes of practicing Christians but hundreds of thousands of atheists as well. Although most Americans own a Bible, use of the Bible varies significantly. In a poll taken by the Gallup Organization in October, 2000, 59% of Americans reported that they read the Bible at least occasionally. This is down from 73% in the 1980s. The percentage of Americans who read the Bible at least once a week is 37%. This is down slightly from 40% in 1990. According to the Barna Research Group, those who read the Bible regularly spend about 52 minutes a week in the scriptures. Barna, "The Bible," data is from 1997. Women (42%) are more likely than men (32%) to have read the Bible in the past week. When it comes to going beyond merely reading the Bible to actual study of the Bible, the numbers decline sharply. Only one in seven Americans report an involvement that goes beyond just reading the Bible. According to Gallup, "Despite the impressive statistics concerning Bible reading and study, it is apparent that ignorance about its contents is widespread." Only half of adults interviewed nationwide could name any of the four Gospels of the New Testament. Just 37% of those interviewed could name all four Gospels. In America we "take the Bible for granted". For many, it is something we own and have sitting on a shelf, but not something which changes the way we live our everyday lives. Around the world, this is not the case. In fact, there are still countries around the world and people groups who have never had a Bible in their own language. New Tribes Mission works with people around the world to get God's Word translated into these languages. They are currently working with the Mwinika people in Mozambique. 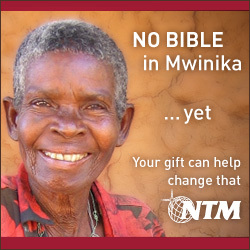 There are more than 200,000 Mwinika people and a New Tribes "missionary team has prepared the groundwork for translating the Scriptures into the Mwinika language. The translation project will extend over the next 15 years including printing of the Old and New Testaments and continuing translation and literacy preparation work. You can be a part of reaching the Mwinika people with the Gospel of grace. Helping to fund the translation project will ensure that further generations of Mwinika people will be able to read the Scriptures and grow in the knowledge of God through your provision." Consider involving your grandchildren in a project to raise money to send to New Tribes so Mwinika children, families and adults will be able to learn of God's love and forgiveness in their own language! You could have them collect "pledges" for each verse they memorize, make Bible bookmarks and sell them to raise money for the Mwinika people so they are able to have their own Bibles or even have them make their own Bible story books with their favorite Bible story - of course illustrated by them - and then sell them to raise money for this project. These are just a few ideas but consider doing something to help your grandchildren understand how important it is to have God's Word, read God's Word, study God's Word, live God's Word and share God's Word with people who do not have it!